Any tips for scanning 2 1/4 negatives? That is the look provided by film - people have become addicted to sharpness in the Digital Age - which is why I use the term "needle sharp". I thought the top one was a little blotchy in the lighter sections. It printed better than it looks here.. When I scan a slide or negative of any size, I then inspect it at 200% and at 50% in gimp; if I see any issues, such as a spot or scratch, I use the editor to fix it. This sort of process seems the natural thing to do to me. 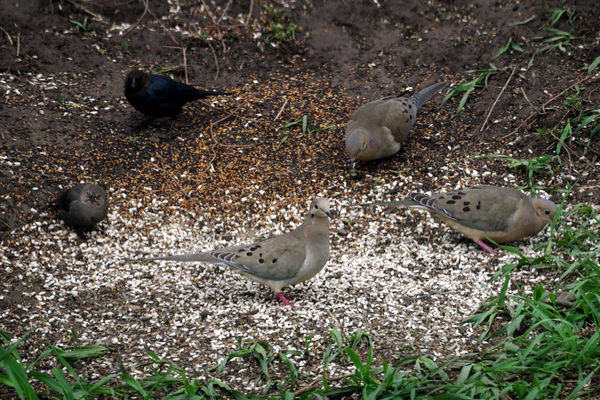 Three Mourning Doves, a Cowbird, and someone without a "My Name Is" tag all gathered under our bird-feeder to share the seeds that had fallen out. I guess you will never grasp the advantages of a larger sensor if you never use one. I know the advantages - my wallet knows the disadvantages. I have better uses for the $$$$. I don't use any thing auto. But the auto focus lens and I don't trust it enough so I check it every picture. It might be okay that way. But I don't trust auto.anything. I set maximum ISO, and then check what it is using. Automation allows camera to do that which can be automated, and leave to me the things that only I can do. Since you can't be bothered to use "Quote Reply" I have no idea what you are responding to, but I will respond - an older Nikon certainly is inferior to current cameras from other manufacturers; testing shows the Pentax KP to do very well at higher ISO values, which is what matters to me. Well 24 MP spread over an image cannot give the quality of 46 spread over the same image. If you are serious about wide angle you need FX or MF. But if you are happy with your DX so am I . You must be a Nikon user. That is fine, but I'd rather spend $700 on a Pentax KP - I have other uses for the other $2500. Other than that - 10mm seems to be the widest most UWA-Zs go (Tokina uses 11mm) … whilst the widest you can get in a FF UWA is 14mm … that 4-6mm difference may not seem like much, in print, but it makes an enormous difference in perspective - when looking at the finished photos. FF has an advantage in some things, but there are trade-offs - one of which is the larger amount of space required to save those images - which means there's less room on your SD Card, and less room on your HD. I don't quite see why you would use an ultra wide ( 10mm) on a DX crop sensor particularly a Canon . If you halve the focal length you need 4x the pixels to maintain the same sharpness. So DX for landscape is a bit of a bum idea. But of course if it makes you happy then its fine. I personally use the 14mm Samyang on a D850 for wide shots at weddings particularly the first dance using disco lights I supply myself and of course church interiors/reception and scatter groups from the top of a ladder. You use UWA with "FF" but don't see why I would use UWA with "APS-C"?? Maybe I want to take 1 photo instead of 4, and I don't need, or even want, 96mp. Yes, that's true, Martin ... but there's more distortion in the corners with some lenses, than with others. I don't use ultra-wide much with man-made structures - mostly with nature photos. 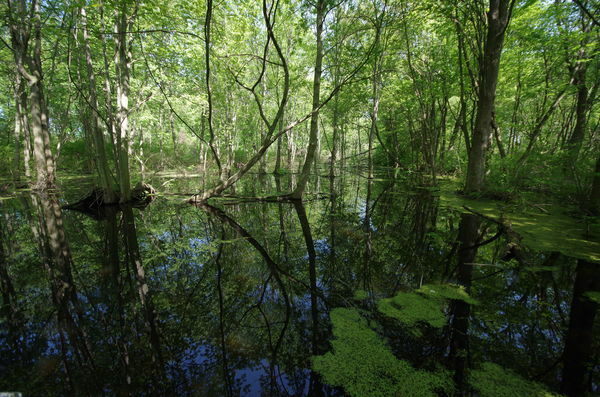 Four years ago when I switched from Canon to Pentax, the Sigma 10-20mm lens is the one lens I truly missed, and then I found that they made that one in K-mount also. I don't normally worry about the corners - I don't put anything important to me there in any case. A wider lens allows me to get closer, which creates a more intimate "there with me" image. Muellar Report Exonerates Trump... good so I'd like to read it to understand. Maybe after reading it, I can understand the error of my Liberal leaning ways. Here it is. Read it, not Barr's comments. Has anyone seen a cardinal (bird) like this before? Most of us wouldn't see a bird native to South America - outside a zoo, that is. Shot at a zoo in St. Augustine. There is a South American bird called the "Red Crested Cardinal"
Fortunately, an art historian used a laser device to make a nearly perfect digital map of the cathedral just four years ago. What to do with Vietnam era cameras and lenses? No, haven't used any of the bodies, only the lenses, if the bodies were in good shape I just threw them in a box or a drawer, still have them because I don't want to just throw them away, but don't shoot film, maybe someday. I don't understand how you can announce they have light leaks if you haven't run film through them.